Diamagnetic materials are repelled by a magnetic field; an applied magnetic field creates an induced magnetic field in them in the opposite direction, causing a repulsive force. In contrast, paramagnetic and ferromagnetic materials are attracted by a magnetic field. Diamagnetism is a quantum mechanical effect that occurs in all materials; when it is the only contribution to the magnetism, the material is called diamagnetic. In paramagnetic and ferromagnetic substances the weak diamagnetic force is overcome by the attractive force of magnetic dipoles in the material. The magnetic permeability of diamagnetic materials is less than μ0, the permeability of vacuum. In most materials diamagnetism is a weak effect which can only be detected by sensitive laboratory instruments, but a superconductor acts as a strong diamagnet because it repels a magnetic field entirely from its interior. Dimagnetic material interaction in magnetic field. Diamagnetism was first discovered when Sebald Justinus Brugmans observed in 1778 that bismuth and antimony were repelled by magnetic fields. In 1845, Michael Faraday demonstrated that it was a property of matter and concluded that every material responded (in either a diamagnetic or paramagnetic way) to an applied magnetic field. On a suggestion by William Whewell, Faraday first referred to the phenomenon as diamagnetic (the prefix dia- meaning through or across), then later changed it to diamagnetism. Diamagnetism is a property of all materials, and always makes a weak contribution to the material's response to a magnetic field. However, other forms of magnetism (such as ferromagnetism or paramagnetism) are so much stronger that when multiple different forms of magnetism are present in a material, the diamagnetic contribution is usually negligible. Substances where the diamagnetic behaviour is the strongest effect are termed diamagnetic materials, or diamagnets. Diamagnetic materials are those that laypeople generally think of as non-magnetic, and include water, wood, most organic compounds such as petroleum and some plastics, and many metals including copper, particularly the heavy ones with many core electrons, such as mercury, gold and bismuth. The magnetic susceptibility values of various molecular fragments are called Pascal's constants. Diamagnetic materials, like water, or water-based materials, have a relative magnetic permeability that is less than or equal to 1, and therefore a magnetic susceptibility less than or equal to 0, since susceptibility is defined as χv = μv − 1. This means that diamagnetic materials are repelled by magnetic fields. However, since diamagnetism is such a weak property, its effects are not observable in everyday life. For example, the magnetic susceptibility of diamagnets such as water is χv = 3005095000000000000♠−9.05×10−6. The most strongly diamagnetic material is bismuth, χv = 3003834000000000000♠−1.66×10−4, although pyrolytic carbon may have a susceptibility of χv = 3003600000000000000♠−4.00×10−4 in one plane. Nevertheless, these values are orders of magnitude smaller than the magnetism exhibited by paramagnets and ferromagnets. Note that because χv is derived from the ratio of the internal magnetic field to the applied field, it is a dimensionless value. In rare cases, the diamagnetic contribution can be stronger than paramagnetic contribution. 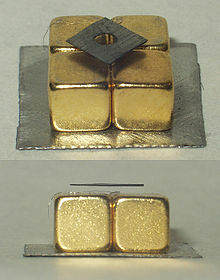 As is the case for gold, which has a magnetic susceptibility less than 0, so is by definition a diamagnetic material, but when measured carefully with X-ray magnetic circular dichroism, shows an extremely weak paramagnetic contribution that is overcome by a stronger diamagnetic contribution. Transition from ordinary conductivity (left) to superconductivity (right). At the transition, the superconductor expels the magnetic field and then acts as a perfect diamagnet. Superconductors may be considered perfect diamagnets (χv = −1), because they expel all magnetic fields (except in a thin surface layer) due to the Meissner effect. If a powerful magnet (such as a supermagnet) is covered with a layer of water (that is thin compared to the diameter of the magnet) then the field of the magnet significantly repels the water. This causes a slight dimple in the water's surface that may be seen by its reflection. 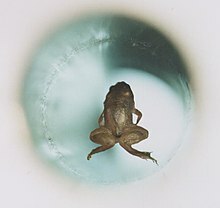 A live frog levitates inside a 32 mm (1.26 in) diameter vertical bore of a Bitter solenoid in a magnetic field of about 16 teslas at the Nijmegen High Field Magnet Laboratory. Diamagnets may be levitated in stable equilibrium in a magnetic field, with no power consumption. Earnshaw's theorem seems to preclude the possibility of static magnetic levitation. However, Earnshaw's theorem applies only to objects with positive susceptibilities, such as ferromagnets (which have a permanent positive moment) and paramagnets (which induce a positive moment). These are attracted to field maxima, which do not exist in free space. Diamagnets (which induce a negative moment) are attracted to field minima, and there can be a field minimum in free space. In September 2009, NASA's Jet Propulsion Laboratory (JPL) in Pasadena, California announced it had successfully levitated mice using a superconducting magnet, an important step forward since mice are closer biologically to humans than frogs. JPL said it hopes to perform experiments regarding the effects of microgravity on bone and muscle mass. Recent experiments studying the growth of protein crystals have led to a technique using powerful magnets to allow growth in ways that counteract Earth's gravity. A simple homemade device for demonstration can be constructed out of bismuth plates and a few permanent magnets that levitate a permanent magnet. The electrons in a material generally settle in orbitals, with effectively zero resistance and act like current loops. Thus it might be imagined that diamagnetism effects in general would be common, since any applied magnetic field would generate currents in these loops that would oppose the change, in a similar way to superconductors, which are essentially perfect diamagnets. However, since the electrons are rigidly held in orbitals by the charge of the protons and are further constrained by the Pauli exclusion principle, many materials exhibit diamagnetism, but typically respond very little to the applied field. The Bohr–van Leeuwen theorem proves that there cannot be any diamagnetism or paramagnetism in a purely classical system. However, the classical theory of Langevin for diamagnetism gives the same prediction as the quantum theory. The classical theory is given below. is the density of states (number of states per energy per volume). This formula takes into account the spin degeneracy of the carriers (spin ½ electrons). In doped semiconductors the ratio between Landau and Pauli susceptibilities may change due to the effective mass of the charge carriers differing from the electron mass in vacuum, increasing the diamagnetic contribution. The formula presented here only applies for the bulk; in confined systems like quantum dots, the description is altered due to quantum confinement. Additionally, for strong magnetic fields, the susceptibility of delocalized electrons oscillates as a function of the field strength, a phenomenon known as the de Haas–van Alphen effect, also first described theoretically by Landau. ^ Jackson, Roland (21 July 2014). "John Tyndall and the Early History of Diamagnetism". Annals of Science. 72 (4): 435–489. doi:10.1080/00033790.2014.929743. PMC 4524391. PMID 26221835. ^ "diamagnetic, adj. and n". OED Online. Oxford University Press. June 2017. ^ Nave, Carl L. "Magnetic Properties of Solids". Hyper Physics. Retrieved 2008-11-09. ^ Poole, Jr., Charles P. (2007). Superconductivity (2nd ed.). Amsterdam: Academic Press. p. 23. ISBN 9780080550480. ^ Beatty, Bill (2005). "Neodymium supermagnets: Some demonstrations—Diamagnetic water". Science Hobbyist. Retrieved 26 September 2011. ^ Quit007 (2011). "Diamagnetism Gallery". DeviantART. Retrieved 26 September 2011. ^ "The Frog That Learned to Fly". High Field Laboratory. Radboud University Nijmegen. 2011. Retrieved 26 September 2011. ^ "The Real Levitation". High Field Laboratory. Radboud University Nijmegen. 2011. Retrieved 26 September 2011. ^ Liu, Yuanming; Zhu, Da-Ming; Strayer, Donald M.; Israelsson, Ulf E. (2010). "Magnetic levitation of large water droplets and mice". Advances in Space Research. 45 (1): 208–213. Bibcode:2010AdSpR..45..208L. doi:10.1016/j.asr.2009.08.033. ^ Choi, Charles Q. (2009-09-09). "Mice levitated in lab". Live Science. Retrieved 26 September 2011. ^ Kleiner, Kurt (10 August 2007). "Magnetic gravity trick grows perfect crystals". New Scientist. Retrieved 26 September 2011. ^ "Fun with diamagnetic levitation". ForceField. 2 December 2008. Archived from the original on 12 February 2008. Retrieved 26 September 2011. ^ a b Kittel, Charles (1986). Introduction to Solid State Physics (6th ed.). John Wiley & Sons. pp. 299–302. ISBN 978-0-471-87474-4. ^ Langevin, Paul (1905). "Sur la théorie du magnétisme". Journal de Physique Théorique et Appliquée (in French). 4 (1). doi:10.1051/jphystap:019050040067800&lang=fr (inactive 2018-09-06). ISSN 0368-3893. ^ Landau, L. D. "Diamagnetismus der metalle." Zeitschrift für Physik A Hadrons and Nuclei 64.9 (1930): 629-637. ^ Chang, M. C. "Diamagnetism and paramagnetism" (PDF). NTNU lecture notes. Retrieved 2011-02-24. ^ Drakos, Nikos; Moore, Ross; Young, Peter (2002). "Landau diamagnetism". Electrons in a magnetic field. Retrieved 27 November 2012. ^ Lévy, L.P.; Reich, D.H.; Pfeiffer, L.; West, K. (1993). "Aharonov-Bohm ballistic billiards". Physica B: Condensed Matter. 189 (1–4): 204–209. Bibcode:1993PhyB..189..204L. doi:10.1016/0921-4526(93)90161-x. ^ Richter, Klaus; Ullmo, Denis; Jalabert, Rodolfo A. (1996). "Orbital magnetism in the ballistic regime: geometrical effects". Physics Reports. 276 (1): 1–83. arXiv:cond-mat/9609201. Bibcode:1996PhR...276....1R. doi:10.1016/0370-1573(96)00010-5. Video of a piece of neodymium magnet levitating between blocks of bismuth. Website about this device, with images (in Finnish).